The Overmind is a dreadnought-class ship for the Substrate. Swarm Dreadnought - Overwhelms enemies with swarms of drones effective against all targets, including air. Drones can be shot down with anti-air weaponry. A swarm dreadnought that serves as an armed, mobile drone platform. Drones, however, are not its only form of attack -- the Overmind boasts 4 Gentle Persuader Level III Plasma Negotiators that fire bursts of energy against land-based targets. Can upgrade to a shield projector to replenish nearby shield integrity. Energy weapon suitable for use against any land-based target. Massive chamber housing nanites that continually replenish 3 swarms of deadly drones. Gives the Dreadnought another drone squadron with the addition of a secondary launch bay. Improves the Drone ManuFactory to maintain a fourth drone swarm. Increases armor by 20% with a permanent coat of extra-hard Durantium alloy. Increase the Overmind armor to 80%. Cuts the Dreadnought's drone respawn time in half with advanced nanoconstruction techniques. Reduces drone swarm respawn time from 2 seconds to 1 second. Adds a module that allows the Dreadnought to quickly refill the army's shields with an energy pulse. Projects a 360 degree ion field that repairs all nearby shields. Interrupts all nearby enemy weapons and propulsion systems with a pulse of disabling radiation. The Controller uses special EMP generators to temporarily shut down enemy units in a wide area. 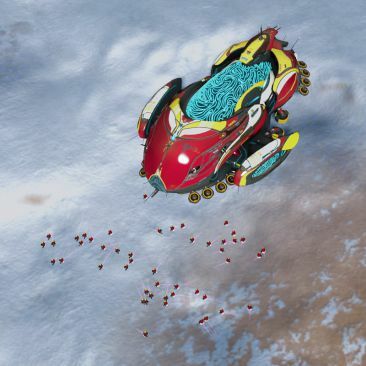 The Overmind can be treated as a tier 3 Drone Hive, possessing 2 Assault Drone Swarms and 1 Anti-Air Drone Swarm, which is invincible (meaning the Overmind always have anti-air damage). However, its drones are significantly stronger (in both health and damage) than Drone Hives and replenish much faster and is a lot stronger than a common misconception that it possesses 3 Drone Swarms equivalent to 3 Drone Hives. Once Shield Projector upgrade is acquired, the Overmind offers very good sustainability and with a few more Caregivers, can quickly recover the shield damage done by EMP Pulse orbital (however, this is not to be misinterpreted as it can completely outlast the combo usage of both EMP Pulse and Plasma Storm together, as that would require a lot of Caregivers). The Overmind weaponry offers generic, but good damage, thus allowing it to engage almost any targets on the ground and air (except for very heavy Strategic Bombers and Air Harbingers), posing serious threat if the opponent is ill-prepared for it. It does, however, have a very exploitable weakness which is its Drone Swarms themselves. This allows high AA damage army to nullify its DPS, allowing the army to slowly wear it down without much casualties. Unlike other Dreadnoughts, the Overmind is strong vs air and requires very moderate or little anti-air support. This can throw player off from the common reflex to use air army to dissuade a Dreadnought army. Combined with being the cheapest Dreadnought, this makes the Overmind usually the first Dreadnought to build and can cause serious threat being alone by itself (if the player chooses to do so) while the main army is posing threats somewhere else. The Overmind attack range is further than a player usually perceives as its Drones can move further away from it with a fairly far leash range. With some meticulous kiting, this can allow the Overmind to siege defenses while taking little damage. This, however, can not exploit Sentinel Turrets, Pulverizer Turrets or their upgraded versions as their range is further than this. This page was last edited on 25 February 2019, at 04:06.